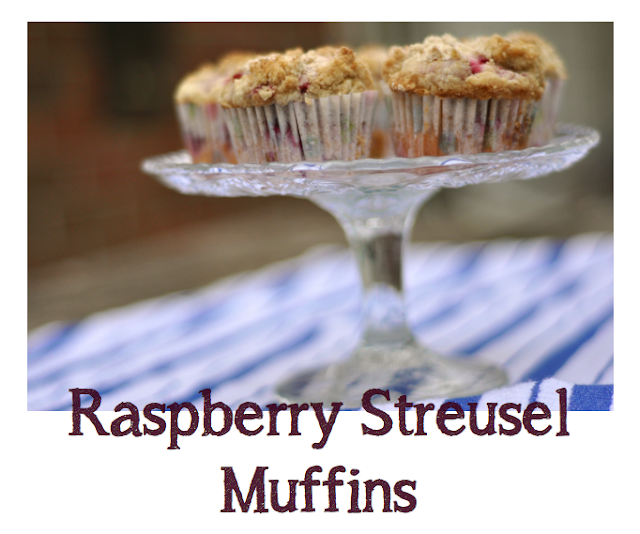 With the abundance of raspberries in our garden (as noted in my last post), I decided to make raspberry streusel muffins. I searched for a recipe on Pinterest, naturally. I found this one, and it turned out great. I absolutely adored this recipe because the streusel topping had ginger in it, which added an interesting kick paired with the tanginess of the raspberries. Normally for muffins, cinnamon would be the flavor in the streusel, and while that would have tasted just fine (if not pretty darn good), it would have been a very dominent flavor, hiding the raspberry tang. I made the muffins with white flour because I was all out of whole wheat. Normally with muffin and bread recipes I always use whole rather than all-purpose, because it tends to add a little more substance. After making this recipe, I realized that, while it is amazingly tasty, I can use a mix of whole wheat flour, barley flour and even some cornmeal to make them more fibrous and nutritious for an on-the-go breakfast. This recipe would also work great gluten-free (just substitute the flour for the same amount of a gluten-free flour). As far as the raspberries go, obviously nothing can beat fresh picked. The recipe called for frozen raspberries and claimed that the frozen berries are easier to deal with when mixing the batter. I could see how a frozen berry would hold itself together a little better than a fresh one, considering raspberries are actually quite mooshy when ripe. If you, like me, picked fresh berries, start by washing them in cold water. Then pat them dry and blace in a bowl in the freezer while you make the batter. This will ensure that the berries hold their form, but are still fresh. Once the berries are placed in the freezer, preheat your oven to 350º and line your cupcake tin. You're going to want to start with the streusel topping. In a medium bowl, mix the dry ingredients, and then using a pastry cutter, mix in the butter until grainy. Set aside. 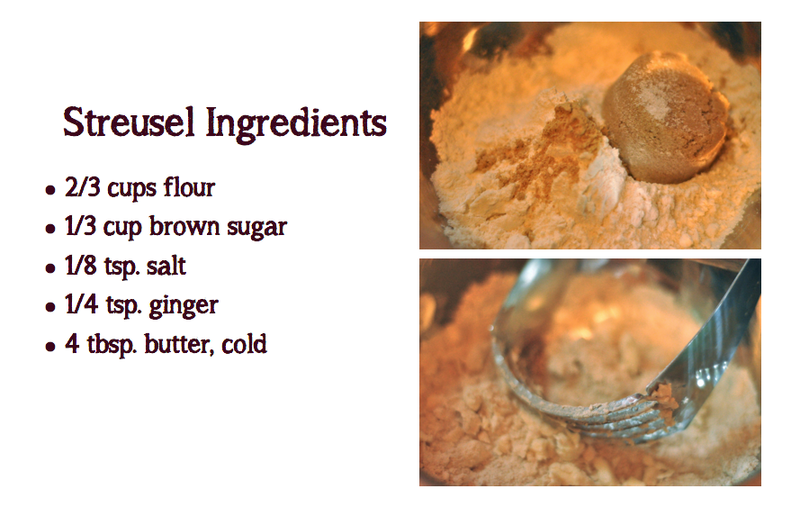 In another medium bowl whisk together the flour, baking powder and salt. In the bowl of your mixer, blend the melted butter, sugar and egg until well combined. Stir in half the flour mixture, followed by the buttermilk, and vanilla and almond extracts. Stir in the remaining flour just until the dry ingredients are incorporated (do not over mix). Take your raspberries out of the freezer and toss with 2 teaspoons of flour so they don't bleed. Then fold the berries into the muffin batter. Scoop the batter evenly into the muffin pan. 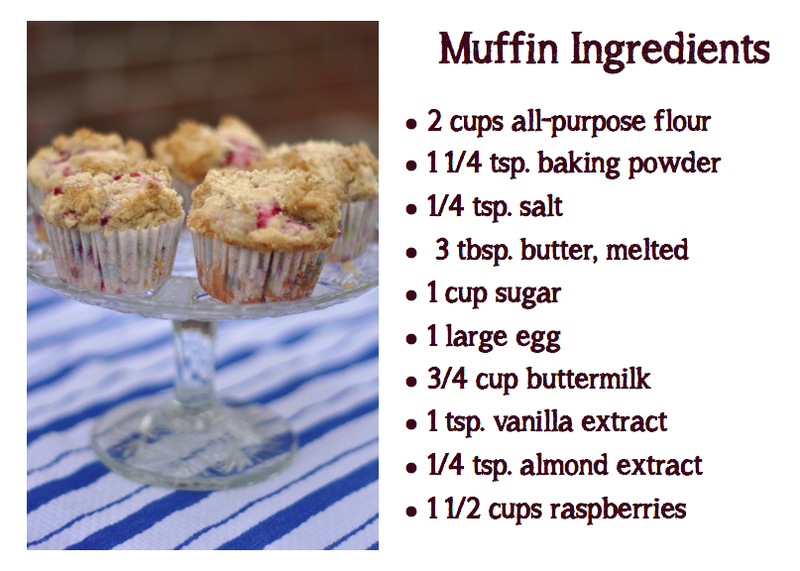 This recipe should make about 12 muffins. Cover generously with the streusel and bake for about 20-23 minutes.